Brittle Bush lighting up shorelines Monday, March 27 at Lake Pleasant. ROOSEVELT LAKE — (2,124 feet, 69-percent full). Water temperatures high-60s during afternoons. Excellent springtime bass fishing reports continue for Roosevelt and Apache Lakes. The recent full moon and stable weather brought huge numbers of bass onto the spawning areas. Lots of bass are staging either before or after spawning. Most anglers are very positive about the spawning weather conditions this year. Fast falling or rising water and storms can have a significant impact on the spawn, but this year the water level is slightly rising and the weather has been mostly stable for our typical springs in Rim Country. The water level is just below the 70% full mark and the clarity has significantly improved. The water temperature is in the high 60’s and low 70’s which is perfect for spawning bass. During April, bass will be in all phases of the spawn and a large variety of baits are successful. One angling tournament team reported an exciting fast action top water bite on a buzz-bait and Zara-Spook. Clearly these are aggressive feeding post-spawn bass. Other anglers reported a deep crank-bait bite in the middle of coves adjacent to spawning flats which are pre-spawn bass staging, prior to moving shallow. Crappie anglers are reporting seeing spawning activity by male crappie but not in big numbers. The continued increase in water temperature and the full moon should bring the female crappie to the shallow water within the next week. On a recent clear, brisk morning, several of the most experienced Roosevelt Lake anglers assisted the AZGFD with a stocking of 25,000 Florida Strain Bass and 12,000 Black Crappie. The anglers were waiting at the Cholla ramp when the Game & Fish staff arrived with the truck hauling the fish. The 25,000 bass number is lower than originally expected, however, the size of the bass were in the 4″ to 5″ range. The larger the fingerlings, the higher the survival rate, so we’ll take size over quantity any day. Ninety percent of bass 5″ or larger will survive while only 30% of 2″ fingerling will mature to spawn. The actual stocking started at 7 AM and ended around 8:30 AM with each boat making about 5 trips with plastic cans filled with fish. The anglers reported a nearly 100% live release success rate with less than 5 crappie that didn’t make it. Art Chamberlin, Dennis Pirch, Fred Manfred and Linda Brauburger, with Curt Rambo as a “consultant” took the lead on dispersing the crappie. More than a dozen highly experienced bass anglers, who are very knowledgeable of Roosevelt Lake, distributed Florida Strain Bass throughout the lake. “Who better to release the fish than the guys who fish the lake three times per week and know areas where the fish are likely to survive” said Jeremy Ulmer of Payson. This is the third consecutive year the AZGFD has stocked Florida Strain Bass into the lake and the first year for crappie stocking. Water temperatures have been in the mid-60s. Stripers being caught are full of eggs and caught at an average water depth of 30-45 feet. Try the northern coves this time of the year. Live shad remains a go-to bait for striper fishing. Water visibility is limited in the northern coves but clear in open water. Motorized access to the upper arm of the Agua Fria River at Lake Pleasant via Table Mesa Rd. 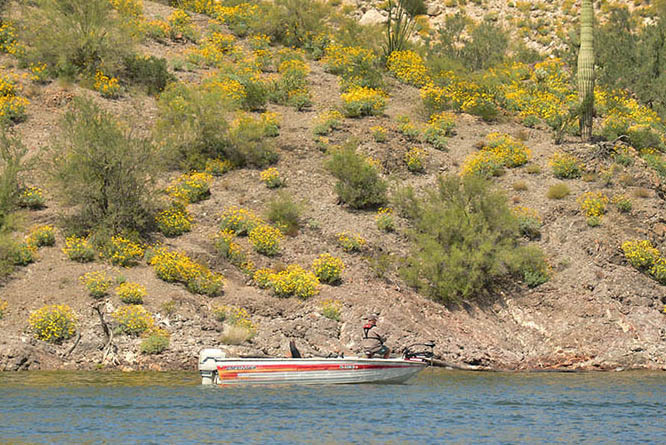 is again be available thanks to a special development project of the Arizona Game and Fish Department’s Boating Access Program. Through the cooperative efforts of the Department, the Maricopa County Parks and Recreation Department and the U.S. Bureau of Reclamation, this unique boating and fishing opportunity will be available each Friday through Sunday throughout the spring — it began Friday, March 24. Operating hours are from 6 a.m. to 5 p.m., and regular park entry fees apply (exact change required). See more information. BARTLETT LAKE – Lake elevation is 1,796 feet, feet, 98 % full. Cortez Lake fish stockings have been postponed until further notice. The Arizona Game and Fish Department and Phoenix Parks and Recreation Department have determined that a golden alga bloom caused the fish kill suffered in the lake over the past week. Golden alga can release toxins that affect cold-blooded, gill-breathing organisms such as fish and clams. The Arizona Department of Health Services has determined that human health is not affected by exposure to the toxins. Common sense should be exercised by not picking up dead or dying fish for consumption. CANYON LAKE – Lake level is 1,657 feet (97-percent full.) The final rainbow trout stockings of the winter season took place a month ago. Fishing likely is pretty difficult – but Canyon is the land of lunkers when it comes to bass. For better numbers, try Bartlett or Saguaro. HORSESHOE LAKE – Lake elevation is 2,018 feet (83-percent full). LOWER SALT RIVER – On Thursday afternoon, the river was flowing at 8.4 cfs out of Stewart Mountain. Is being stocked with trout this week and next week. No new reports of success. Jim Goughnour of Rim Country Custom Rods previously reported trout fishing in Rim Country streams is also being called excellent. The water levels are slowing back to normal flows so look for trout in pools or undercuts along the streams. Dogtown Lake was stocked with 2,600 catchable (10 inch) yesterday for the first time this year. The hatchery will also be stocking a load of smaller (6 inch) Rainbow Trout later this week. These fish need to be moved from the hatchery to reduce crowding and allow other fish to grow up to size faster. Dogtown is one of the few lakes in the region in the area that produces enough food to grow these smaller fish. Fishing has been slow, but the few holdover fish being caught are nice size fish. 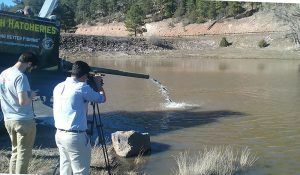 About 3,600 Rainbow Trout were stocked in Kaibab this week. The lake is still muddy so fishing is probably slow. I would try small silver or gold lures to try and catch the trout. Much like the Williams area lakes most of the lakes in the Flagstaff area are full and spilling. Lower Lake Mary isn’t spilling, but it has more water in it than any year since 2010. Again, just like in the Williams area, we don’t have enough fish to stock every lake this year so only a few lakes will be stocked in the Flagstaff area. Ashurst Lake, Lower Lake Mary, and Frances Short Pond will be stocked with trout this year. Ashurst is full! The road is open and the first load of 2,700 rainbow trout was stocked last week. Another 2,600 were stocked on Monday. The water in the lake is relatively clear so I would try fishing with lures for the fresh stockers. With the low water level of the lake prior to the spring runoff I don’t think many fish survived the winter. Frances Short pond was stocked last week and will be stocked this week. Folks have been catching fish using flies and lures. Some have also been caught garlic powerbait, baby bell cheese, corn or worms. Stocked Monday. Lower Lake Mary has had about 22,000 larger (10 + inch) Rainbow Trout stocked in the last couple of weeks along with about 8600 smaller (6-8 inch) Rainbow Trout. The recent stocking of Rainbow Trout contained some really nice trout with one being measured at about 18 inches. One angler reported that he and 2 friends recently caught 11 nice sized trout on the backside of the lake using PowerBait. Fishing was slow but the fish were really nice size. Fishing was slow during last the weekend as the freshly stocked fish spread around the lake. Another load of smaller rainbow trout (6 inch) will be stocked this week. My coworker caught and released 102 trout last Tuesday on flies with a size 12 bead head prince nymph and size 12 zebra midge working best. Folks were also doing well on small lures. A new state record Channel Catfish was caught on an anchovy 3/26. The fish was 39.5 inches long and weighed 33.36 lbs. The person who caught the fish also told us some of his friends have been catching some nice Northern Pike on anchovies. Spring fishing is here! Willow Springs, Woods Canyon, Fool Hollow, Rainbow, Scott and Becker lakes are all being stocked this week with rainbow trout! They all also have holdover trout in there. Bass fishing is good in Show Low, Rainbow, and Fool Hollow lakes. Fishing is good at Becker Lake, Big Lake, Carnero Lake, and River Reservoir, Woods Canyon and Willow Springs lakes. Several lakes with good holdover provide good fishing, including Becker Lake, Big Lake, Carnero Lake, Hulsey Lake, and River Reservoir. *Forest Road 300 (Rim Road) to Bear Canyon Lake is still closed for the winter. Forest Road 300 (Rim Road) is slotted to open to access Woods Canyon Lake this Thursday. BEAR CANYON LAKE – Inaccessible. Forest Road 300 (the Rim Road) is still closed for the winter as of 4/4/2017. WILLOW SPRINGS LAKE – Fishing is currently good/fair for carryover rainbow trout and tiger trout as well as freshly stocked rainbow trout. The road to the boat ramp is now open and boats can be launched. No ice. 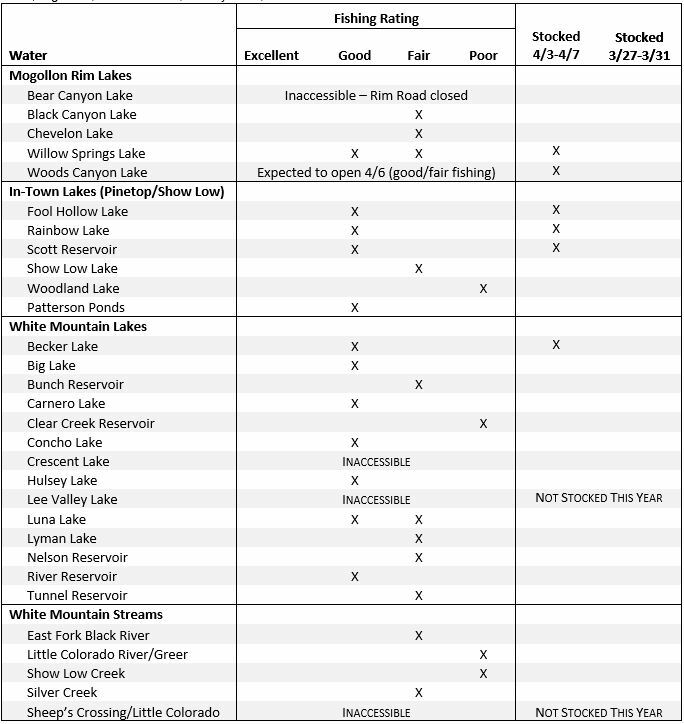 WOODS CANYON LAKE – Inaccessible until 4/6/2017. Forest Road 300 (the Rim Road) is still closed for the winter as of 3/24/2017. No ice. You can walk in from the locked gate just off Hwy 260. Fish should get stocked here this week so fishing should be fair/good if stocked. FOOL HOLLOW LAKE – Fishing is good for stocked (12”+) rainbow trout and bass! No ice. Carryover rainbow trout are being caught. The lake is full for the first time in several years. Fishing pier and platforms are accessible! Northern pike are may still be in the shallow southern portion of the lake. Large catfish were also found in the shallow southern portion during a recent fish population survey. Largemouth bass and smallmouth bass are staging to spawn and can be caught! RAINBOW LAKE – Fishing is good for stocked (12”+) rainbow trout and bass! Lake is full and spilling. No ice. The pike spawn is over and they are dispersing back throughout the lake, but can still be caught with shiny lures. Try you luck for largemouth bass. SCOTT RESERVOIR – Fishing is good for stocked rainbow trout! The lake is full and spilling. No ice. SHOW LOW LAKE – Fishing is good for stocked (12”+) rainbow trout and bass! An almost 7lb smallmouth bass (almost state record) was caught this week! The lake is nearly full and has no ice. Holdover rainbow trout, and lots of cutthroat trout, should be fishing well. The road over the dam is now open. There is a new restroom and fish cleaning station that will be usable once the electricity is connected. Additional facilities improvements at Show Low Lake will be coming soon. * Highways 261 and 273 roads are still closed. 249 Rd is open and Big Lake is accessible. Lee Valley Lake and Crescent Lake are inaccessible. CARNERO LAKE – The lake is ice free. The route to the lake by way of Forest Road 117 is still blocked by a large snowdrift, but you can reach the lake by way of Forest Road 118. Fish surveys have not yet been conducted, but winter limnological surveys show that there should be no winterkill. Tiger trout are being caught and an application for State catch-and-keep record for tiger trout recently submitted. The lake is nearly full! HULSEY LAKE – Fishing is good for holdover rainbow trout. A recent fish survey found holdover rainbows up to 18 inches. No ice. The road is open and accessible. LUNA LAKE –Fishing is fair to good. The lake is full and has no ice. Rainbow trout of all sizes are being caught, including some large fish. Spring warming restarts this week. The best spring fishing happens as water temperature surpasses the 64 degree mark for the first time. Temperature this morning was 53 degrees so there is a long way to go. The weather forecast is for calm weather during the next two weeks with a bit of wind on the weekends. Lake Powell surface temperature will climb to the 57-60 degree mark by the weekend and maintain that level and higher into the next week. See the full April 6 report from Wayne Gustaveson (www.wayneswords.com).